A fun game for large and small groups that helps develop aural skills, pattern recognition, musical independence, and rhythmic reading. This is a great gathering activity to do before rehearsal! Have children choose four rhythm pattern cards with similar rhythm patterns (e.g. quarter and eighth notes or quarter rest patterns), laying them out for others to see (if you have a large group, divide children into groups of 4-5). Children (or groups) take turns choosing one pattern of their four to chant out loud (ideally with a neutral syllable such as “bah”) while others (individuals or groups) try to identify it. For an extra challenge, have children choose eight cards and chant two of their patterns back-to-back. Similar to What's That Pattern? (above), this game helps with pattern recognition, rhythmic reading, and the development of aural skills. Choose three rhythm pattern cards that are similar and hold up for all to see. Choose one pattern to clap or chant. If the children correctly identify the pattern, they earn the card. If they are incorrect, you earn the card. This is a combination of Pass a Pattern (see previous post) and one of the Pie Game variations (below). For a calmer, quieter activity, consider playing a quick round of rhythm bingo. Here is an easy, printable version from Susan Paradis. Give your singers an opportunity to compose by asking them to create a rhythmic series for the group to chant together. For older choirs, ask for a few volunteers to compose and chant their series (as solos, duets, trios, or quartets) for the rest of the choir. 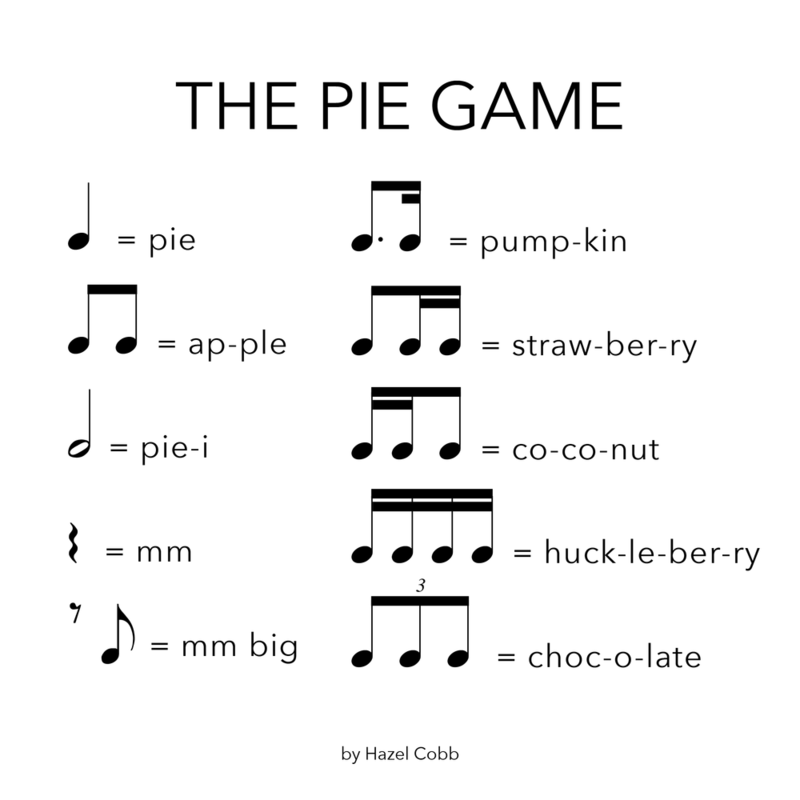 Using a regular set of rhythm cards, the Pie Game helps develop listening skills, musical independence, and rhythmic reading, and gives children an opportunity for improvisation and composition. The possibilities are endless! Have children work together to create a rhythmic series (eight measures, or two phrases). Keeping a steady beat, children chant the rhythm together. After each successful repetition, flip one card over to the blank side (I call this a “wild card”). Have children take turns creating their own patterns in these spots or improvise a pattern all at the same time. Practice sight-reading the rhythm of a new anthem with pie syllables. Have everyone keep the steady beat together. Have children arrange cards in two rows. Chant the patterns together, then divide into two groups, chanting different lines at the same time. This is a great way to prepare young singers for 2-part anthems! Place cards in a box or bag. Pass around the circle and have children take turns drawing a card (discretely) and clapping the rhythm for the others (without chanting the words). Have the others in the circle respond by clapping the rhythm back with the words. Use two identical sets of rhythm cards (so each card has a match!) and arrange in rows, face down. Have children take turns flipping cards over to find a match (or work with a partner). There are lots of ways to incorporate rhythm sticks (or any rhythm instruments for that matter) into your rehearsals. Tap the steady beat while listening to a piece of music. Practice listening for subdivisions by having half of the group play half notes and the other half play quarter notes (or half play quarter notes and half play eighth notes). Read rhythm patterns or echo back by tapping the rhythm with sticks instead of clapping. Create a rhythmic ostinato to accompany one of your anthems. A fast-paced rhythm game that's a cross between telephone (or Pass a Pattern, as mentioned previously) and a relay race. Divide children into two rows (sitting, facing each other). Place a beanbag on the floor in between the two lines. Show a one-measure rhythm pattern to the person at the end of each line (try letting them read it for themselves rather than chanting it for them). When you say, "Go!" have children squeeze their neighbor's hand with the rhythm, passing it down the row. What are your favorite rhythm games and activities for choir? I'd love to hear your ideas!